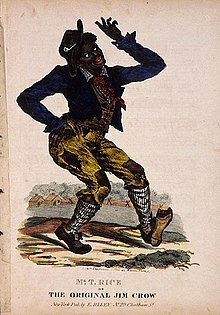 Many different versions of Jump Jim Crow were published, with wildly varying numbers of stanzas. This early edition was published in New York ca. 1832. An keep me dare all night. And den I go to bed. An hole it to de fire. By sawing de ticj oh wood. I can split a horse block. If he didn't turn gray. Dis jumping will be no good. De Wites will saw de wood. Ob our friend Massa Hays. I thought was berru mean. As if I was half white. Or I'll skin you like an eel. Who happen to be white. Full as black as we. What makes him turn pale. If dey want to see de sight. Jist to see de sleeping beauty. In a glass case of monkies. Just like a fox tail. And dey said it was a boar. To be tried by word ob mouth. Dat's tarnal full ob mettle. Is shining in deir eyes. A bold stroke for de niggar. De white is call'd my broder. Is de swee married life. Dere sure can be no harm. dey'll in de gutter lay.